What about if you control your car with your mind. This amazing technology came to existence. Controlling the movements of the helicopter with the mind. The scientist (of course) at the university of Minnesota have made it.they use their thoughts to drive the helicopter. When he wants a turn, it turns and when he wants to straight forward it moves forward. They also published their studies in journal of neural engineering. The technique called ( BCI ) the development of brain computer interfacing to provide the user with the ability to communicate with the world and manipulate objects with the help of thought modulation. This thing is done by a closed loop of sensing, processing and actuation. Over the last ten years scientist made progress enormously in making it possible for us to move the thing by use brain thought. You think it will do. This technology is very helpful for those peoples who are suffering with neurodegenerative who are unable to move their body parts. They can move their body, wheel chair easily by thinking. There are no brain inserts. Brainwave which is called (EEG, electroencephalgraphy) is picked up with the help of electrodes fitted into EEG that goes into scalp.main part is the cerebrum, the motor cortex is the part of the cerebrum that controls the movement.the whole system is working well due to the desired location of motor cortex. When we think about any movement of body parts neurons in the motor cortex emits small electric signals. Each thought respecting each different movement activates a new arrangement of neurons. This has been the first ever attempt ever to use both functionality MRI and EEG imaging to map (judge) where exactly brain neurons are activated when we imagine movements. So we exactly know the location of signals ( where it came from ). The signal of the part we received much easily is of fist opening and closing of the fist. 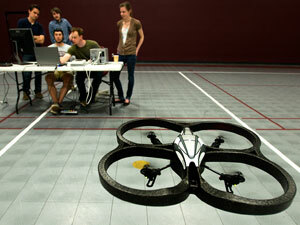 This amazing design will help us one day to optimize the design of the system to control flying object my real time.